404 p., 5 ill., 2 Lesebändchen, 12,7 x 17,8 cm. These five short tracts complete Andreaes ideas on religious and social reform. The ›Invitationes‹ and the ›Dextera Amoris Porrecta‹ outline an allegorical-spiritualistic theology of love, in accordance with Johann Arndt, and include ideas from the Rosicrucian texts (cf. Vol. 3) for the establishment of an elitist society to promote religious reforms. The short text ›Imago‹ focuses on the other hand on a reform of all scientific disciplines. What is remarkable is the emphasis on its encyclopedic context and the precise references to the implementation and the organization of research. The ›Unionis Specimen‹ is part of the history of pietism. This is a manifesto for a union of reform-oriented Protestant theologians which – presumably as the only one of Andreae’s projects – actually did exist. This new edition of the ›Schriften zur christlichen Reform‹ makes available to readers what ought to be the essential legacy of Johann Valentin Andreae, a legacy that has been unfortunately obscured by the unavailability [of] texts. As such, it is a most welcome addition to Andreae scholarship. 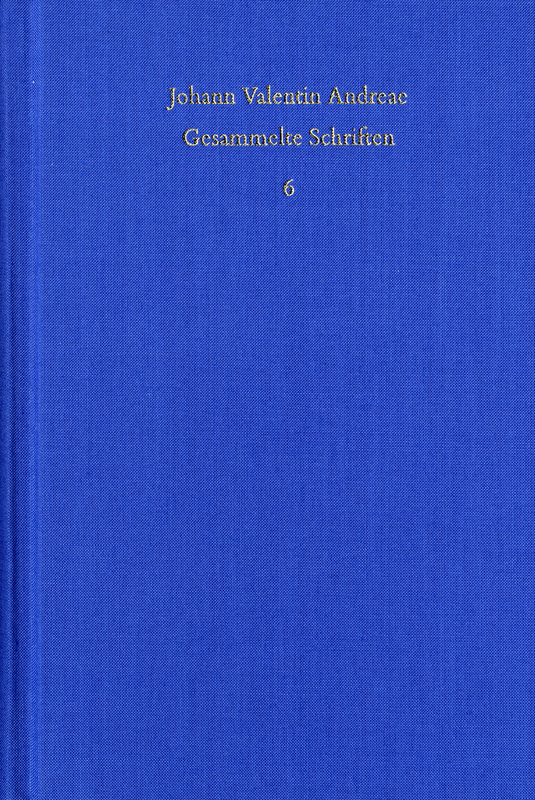 With each new volume of the ›Gesammelte Schriften‹ that appears, the portrait of this educational and social reformer, who so embodied the Protestant culture of Germany in the transition from Renaissance to Baroque, becomes more complete. Dieser sorgfältig gemachte Band ist für die Andreae-Rezeption wesentlich und erhellend für die Rosenkreuzerforschung, womit er sich für ein breiteres Lesepublikum empfiehlt. erfreulich präsentieren sich die von Böhling herausgegebenen Schriften zur christlichen Reform [...] in einer eigenen, gut lesbaren neuhochdeutschen Übersetzung [...] welche die Rafinesse und den rhetorischen Impetus des Andreaeschen Lateins auch im Deutschen einzufangen versteht.